Well, its hot and humid again in Northeast Ohio, so tonight I wanted something light and cool for dinner. I found this recipe a couple weeks ago at a blog called Two Spoons – I definitely recommend checking it out! It called for hardboiled eggs, but I’m not a fan, so I just skipped that step. 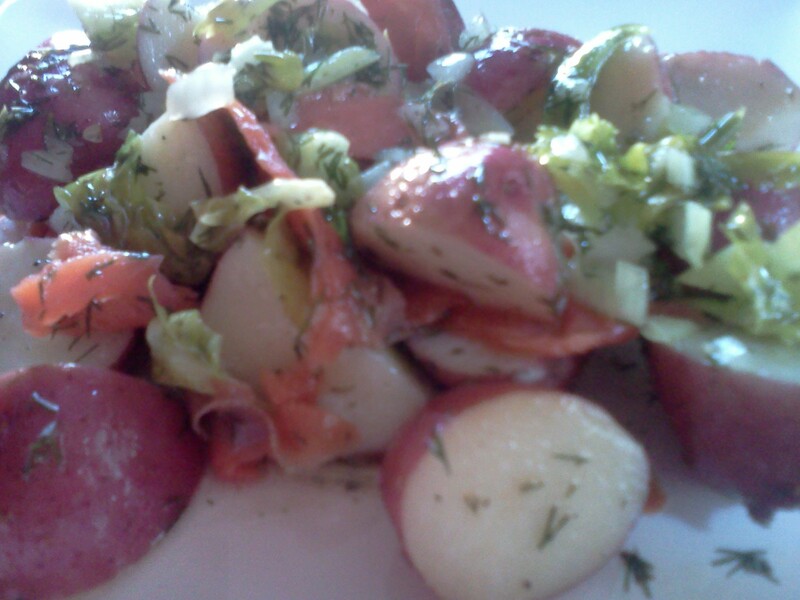 It’s basically new potatoes (from my CSA box), finely chopped onions (from my CSA box), celery and celery leaves, fresh dill, lemon juice, olive oil, smoked salmon, salt and pepper. So yummy! My CSA box on Friday was fantastic. Not only did I get the potatoes and white onions I used in the recipe, but also several heads of cabbage (coleslaw, anyone? ), cucumbers, pickling cucumbers (eaten by Brian Friday night), zucchini and yellow squash, garlic, green onions and spring onions. Here’s a shout out to Basket of Life Farm! It’s amazing the difference that truely fresh produce makes. Even after making a big ol’ batch of coleslaw on Saturday, I still have two heads of cabbage to use up, so any cabbage recipes/suggestions are welcome! In a couple days, I’ll post an update and some pictures of the topsy turvys. A bunch of tomatoes are starting to turn red, and the pepper plants are just exploding! You can barely see the planter – there has to be at least several dozen peppers that are getting big enough to pick. Can’t wait to make some fresh salsa! This entry was posted in General on July 16, 2012 by Melissa. Come and link up to this week’s CSA Link party…http://inherchucks.com/2012/07/11/whats-in-the-box-34/. Hope to see you there! Linked up! Your CSA box this week looks amazing. I’m so jealous of the strawberries and leeks! I thought about you when I was making this – it seemed right up your alley. We’ll get your computer sorted out soon! Wow! This looks so delicious I want to eat it right now! It is a great idea for a summer meal! Thanks! Thanks! It was really good. It could maybe have used some of that garlic scape butter garlic bread on the side though…. Thanks! And thanks for the link – I’ll definitely check it out! It’s fun to see what other people get in their CSA boxes, and I’m always looking for new recipe ideas.